The chain set has distinctive chain rings with Heron Heads. Early versions showed signs of weakness with Raleigh introducing a MKII version in 1950 with strengthened cranks. 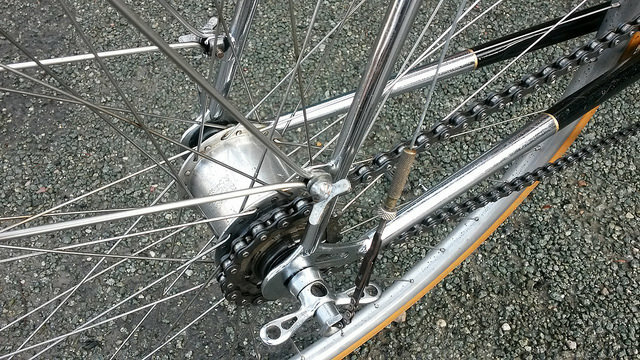 Crank rings were available in 44t, 46t, 48t and 50t, although the 50t chain set was discontinued in approximately 1950. These are very rare to-day as they were quite often, in the life of the bike, substituted by other lightweight components as they wore out. 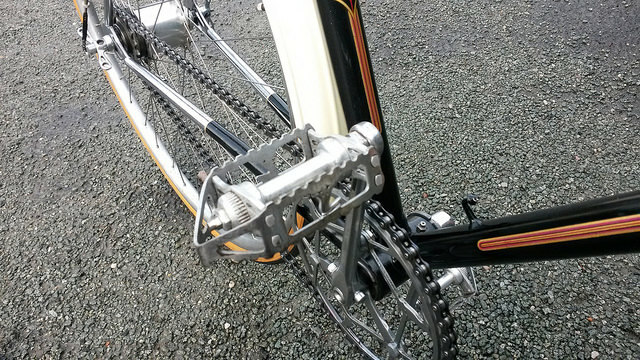 There is some intrigue with the chain set on the Internet, whether it was manufactured by Williams or Chater Lea. 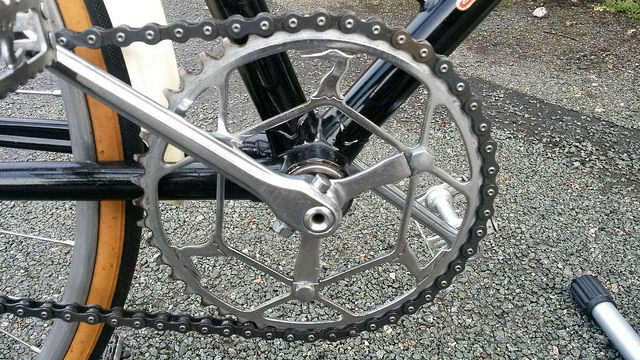 I have reproduced an article published in the Vintage Cycle Club magazine in 2014, with the permission of the writer David Rodd which details the history of this rather beautiful component and proves definitively that the chain set was made by Walton and Brown. These were made from a combination of steel and Hiduminium alloy. They are delicate and again have Heron Heads. These are very rare to-day as they were quite often in the life of the bike substituted by other lightweight components as they wore out. 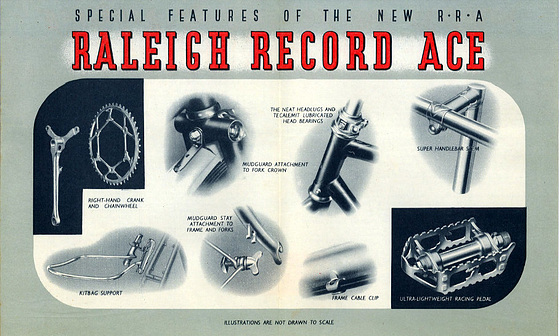 The Raleigh Record Ace had a hollow nickel steel axle (A-16-N). This may be seen in the chain set photograph. I have since found out that the hollow bracket was made available for the 1949 season. I will revert this back to the original solid bottom bracket this Winter. I have this component. 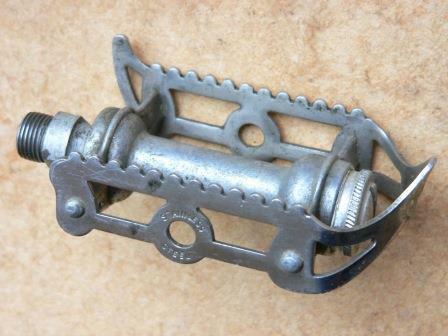 The Raleigh Record Ace stem was available in several lengths (1”, 2½ ” and 3½”) This has decorative lugs that match the frame. These are very rare to-day as they were quite often in the life of the bike substituted by other lightweight components as they wore out or the bike was sold and required a change in length. The Raleigh Record Ace headset may possibly have been used on other high end Raleighs of the era, although it is considered unique to the model. These are very rare to-day as they were quite often in the life of the bike substituted by other lightweight components as they wore out, although I have heard it is quite hard wearing. This may be seen in the stem photograph. These are unique to the Raleigh Record Ace. The wingbolts are the rarest component to find now. This is again a very hard component to source, This is of a closed top design as shown below and is 10″ long. It is manufactured from Reynolds Hiduminium alloy with this being inscribed on the lower part of the bullet. This was available for both round and D section forks. I have a lamp bracket for D section forks which my Dad’s bike has. 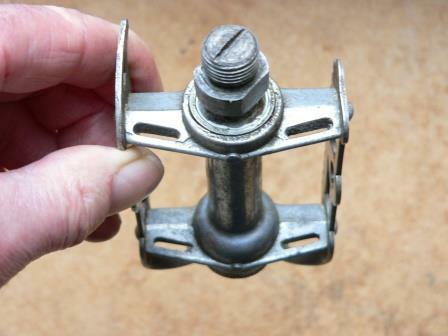 The rarest version of the bracket is for round forks as this was specifically for the Raleigh Record Ace, whereas the D version was used on other Raleigh cycles of the same era. This is shown below, re-chromed. Gorgeous! This is well designed and located on the pips on the rear of the frame. It was designed to be quickly removable. This is shown below.